The colossal squid – first described in the early 20th century – is known from about 11 specimens, of which only three or four are intact: most are fragments of arms or branchial crowns recovered from sperm whale stomachs. Te Papa, the Museum of New Zealand, has one complete subadult specimen in its collections, and over the last few days we have been examining an incomplete specimen weighing 161 kg which was collected earlier this year. The largest known specimen, the 495 kg squid collected in the Ross Sea in February 2007 by the fishing vessel San Aspiring, is thawing in preparation for study on the 30th April. From the measurements taken by the scientists, Dr Steve O’Shea and Dr Tsunemi Kubodera, while examining these specimens, it will be possible to determine just how big this species grows. At 495 kg the San Aspiring specimen is the largest known invertebrate on the planet. The question is: Does this species grow even bigger, and do larger squid exist? Preliminary measurements of the beak sizes, and the size of beaks found in the stomachs of sperm whales, suggest that colossal squid weighing upwards of three quarters of a tonne may exist! Until the large specimen is completely thawed, and can be ‘unfolded’ from its position in which it was frozen when placed into the fishing boat’s hold, we cannot be sure of its total length. 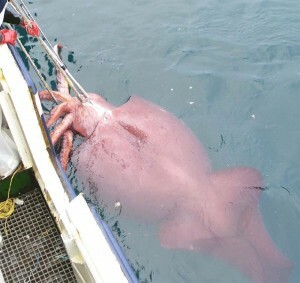 Using the known beak sizes, weights and lengths of the few specimens available, it will be possible for the scientists to determine an upper size limit for the colossal squid species. Is the colossal squid the mythical “Kraken” of Norse legend? ohh its horible the doc said it needs to be amutated im scewed i tell you scewed!!!! mabey i should i should see a doctor just to be safe. now my name is matt and wat colour should my squid coz it aint that woo it aint nothing like that mines got a greenish sort of colour to it is that healthy or should i see a doctor??? Hey Emma, I’m part of the team at Te Papa working on the squid exhibition and I’m also really keen to see your project! Did it turn out ok and what did everyone think about it? I hope you’ll send us a picture of it through soon. Yay! I am looking forward to it. You can email me at lucyh @ tepapa.govt.nz – you will need to take the spaces out of my email address. I am looking forward to seeing your project! Cool Emma – glad we can be help! You say you are at the gluing stage – are you making a poster or doing some pictures? Do you have a scanner or a digital camera? I would love to see what you have produced! P.S. Thanks soooooooooooo much Te Papa!!! Oh and this page has some great drawings of the giant and colossal squid! Both squid and octopus are cephalopods, a class of molluscs. What’s the difference between a colossal squid and a giant squid? Colossal squid (Mesonychoteuthis hamiltoni) are slightly shorter than giant squid (Architeuthis dux), but have a larger, heavier body. Te Papa’s colossal squid tips the scales at a massive 490 kg. In contrast, giant squid weigh up to about 275 kg. All squid have sharp horny beaks made of material similar to human fingernails. The colossal squid has the largest beak of any squid, including the giant squid. The tips of the colossal squid’s tentacles (the clubs) are armed with two unusual rows of sharp, swivelling hooks, and two rows of tiny suckers. Other squid species also have tentacle hooks. The beak and the hooks are lethal weapons for catching and holding large fish like the toothfish. Hey Lucy, thanks for the reply. I am doing a comparison between the colossal squid, a basic squid and a basic octopus and because not many know much about it as a result I haven’t got much info on it. By the way, I’m home sick today(friday),and my teacher has got the day off and it’s teacher only day on Monday so my project gets handed in on Tuesday the 26th of August. Yay !!! P.S. How big is it? Some websites say: Oh, it’s 13m, 20m and all sorts of things. How big is it really. But the thirteen metre one I’m guessing is either the giant squid or the immature female caught in 2003. Also you may not know that yet because this one is not yet thawed out.By the way on wednesday my brother helped me measure it down our long hallway, Its MASSIVE !!! What kind of informaition are you after? If you have some specific questions let me know and i can find out for you. Or there is lots of Squid information on our website. I am 10 years old and Dad Convinced me to do my project on the colossal squid.I am finding it really quite fun.Man, it is soooo big! !Any way I was wondering if you Could possibly send me some more info before friday the 22nd of august. Thanks so much you guys !! P.S. I can’t wait til’ it’s on display !!! We don’t know how old the squid is. From what we know about other squid, it may be 2-3 years old. Colossal squid make up about 70% of the diet of sperm whales in antarctic waters, so there must be a lot of them! Unfortunately, not many people are going there to find out – the amount of money spent on one space shuttle mission is greater than all the money that has ever been spent on deep sea research ever!! My son want to know how old is the squid and what they eat in the deep sea? How many of them estimated to be in the water below (1000m?)? Does the global warming affected them much? ANy creatures or suprises in the deep? Is any one going there to find out? Seeing this floating in the defrosting bath gave me the shivers! Part of it looked like a bald headed man, or was that something it had eaten and re-gurgitated? If ever I find one in my bathwater, I will sell it to the local Chinese restaurant. What I read it was dying already.. I have been glued to the computer ever since I found out about all of this, it facinates me so much!Thanks very much for letting us watch! I was just wondering though, I was reading about it, and it reads that they caught it/saw it, it was half dead. So was it still actually moving around when they first captured it, did it die on the boat when they hauled it in (if so, what a shame) or was it dieing anyway. Imagine if they hauled it in at it was still alive!! Thank you SO MUCH for putting this on the web for the world to see. I, myself, am mesmorized by everything that you are doing and can’t wait to see what you learn from these two! As with the last poster, I’m sorry they had to die, but what a wonderful opportunity they have given us and what treasures they are to marine science. while I deeply regret that this magnificent specimen was caught, I’m eager to know everything I can about it. I’ll be watching!